Figure 1. Evolution of Popular Science over 125 years (1882-2007). Detail. See the full size image on Flickr. Detail of Figure 1. See the full size image on Flickr. Figure 2. All issues of Science magazine from the beginning of publication in 1880 to 1906. Detail. See the full size image on Flickr. Detail of Figure 2. See the full size image on Flickr. 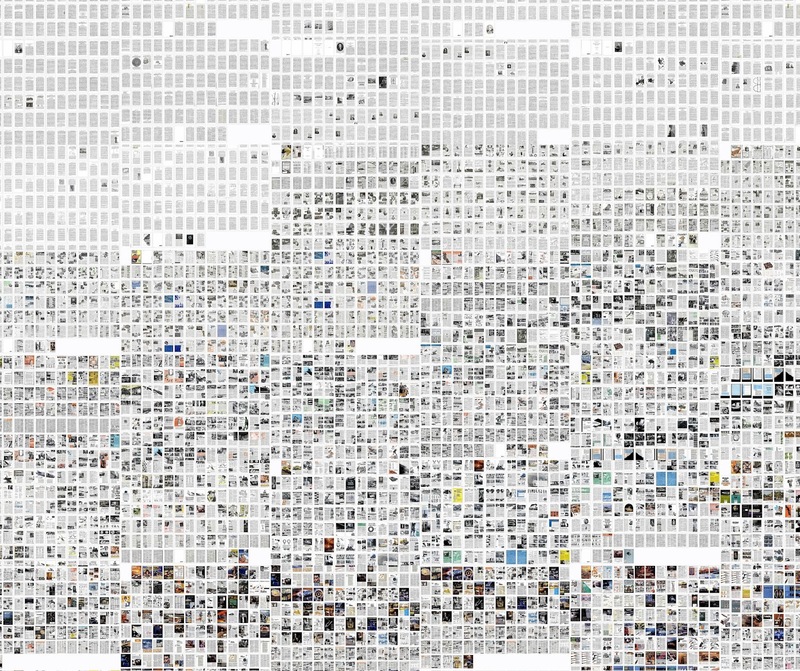 See the full resolution visualizations on Flickr. This project explores changing strategies in use of images, layout, and content of two magazines: Science (1880-) and Popular Science (1872-). 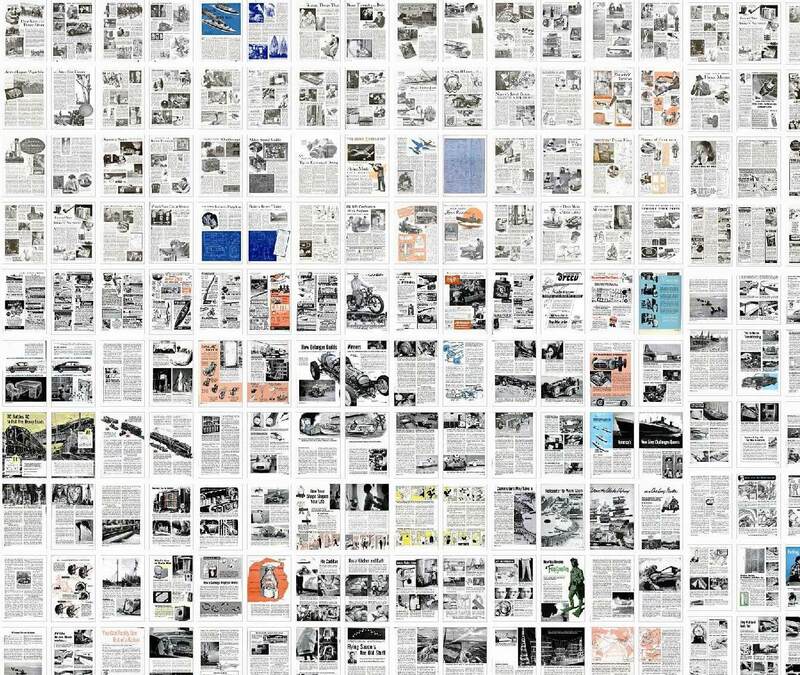 By arranging thousands of magazine pages into s single high resolution image, we are able to reveal gradual temporal changes over long historical periods. The first visualization (Figure 1) shows evolution of Popular Science over 125 years (1882-2007). Data: Popular Science magazine - one issue per every five years from the beginning of magazine publication. Mapping: The issues are arranged in the order of publication (left to right, top to bottom). The second visualization (Figure 2) shows Science magazine. Data: All issues of Science magazine from the beginning of publication in 1880 to 1906. 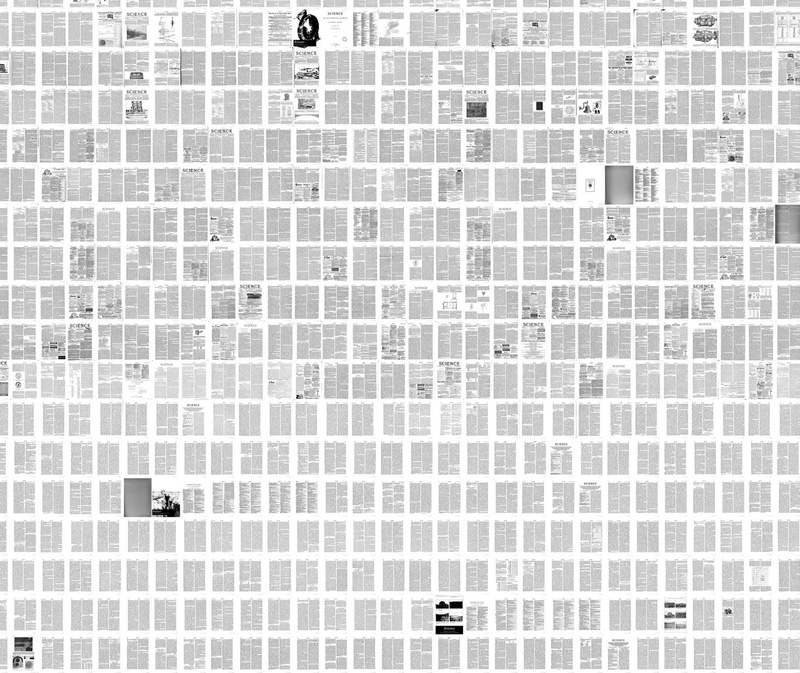 Our visualization uses every 3rd page of every issue (9801 pages total). Mapping: The pages are arranged in the order of publication (left to right, top to bottom). Now let’s zoom and compare the first few decades of Time and Popular Science magazines. At first, Science includes photographs and hand crafted illustrations. These images are the legitimate parts of the process of creating scientific knowledge. However within about 10 years they disappear almost completely. The only images that are now generally permitted are graphs: illustration and photo documentation are increasingly treated as a way of communicating the work of science, rather than belonging to the work of science itself. In the last decades of the 19th century scientists make new discoveries that are translated into key technologies of modern society (electricity, wireless communication, etc.). These technologies and the models that inform them are less about understanding the visible and increasingly about the knowledge of, and the explanatory power of, the invisible. 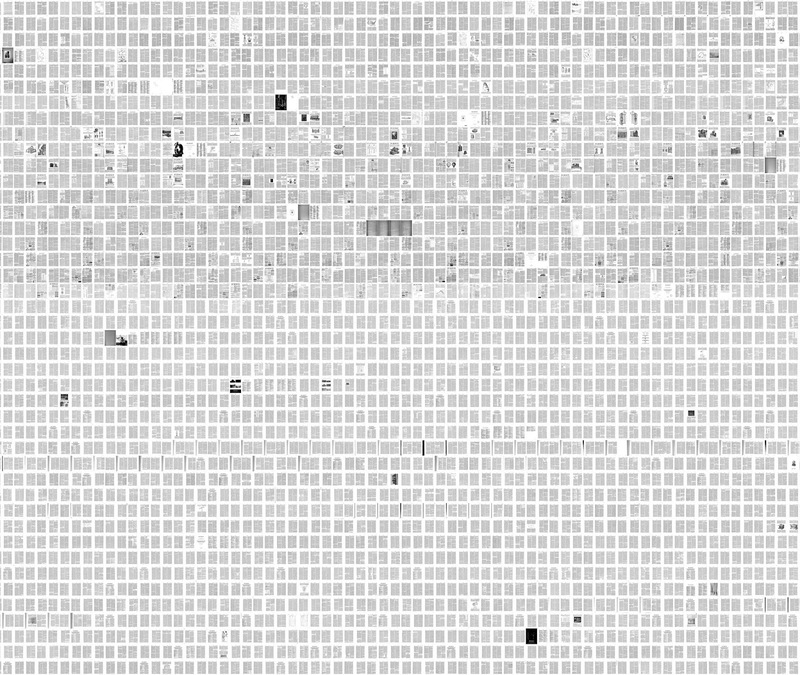 Visualization of 9801 pages of Science reflects this increasing importance of the invisible, and the relegation of the visual to explanation. 4535 covers of Time magazine, 1923-2009. Visualizations of Science and Popular Science in the exhibition Here Not There: San Diego Art Now (Summer 2010) at Museum of Contemporary Art San Diego (MCASD). The Evolution of Popular Science Magazine over the Past 125 Years , infosthetics.com, 11.22.2010. A Century of Popular Science, gizmodo.com, 11.23.2010. 125 Glorious Years of Popular Science in One Giant Picture, popscience.com, 11.23.2010. Popular Science as Seen through the Ages, vizworld.com, 11.23.2010. Popular Science escribió la historia, neoteo.com (leading online technology review in Spanish). 125 ปี Popular Science ในภาพๆ เดียว, thaizad.com, (popular online technology review in Thailand).